Flexibility, precision, ease of operation and hygienic safety: with its Innopouch Bartelt® K series KHS presents a pouching machine with a full range of servo equipment. With an ever increasing variety of products to be processed this system offers the beverage and food market many advantages with its short setup times and high level of productivity. Flexibility, precision, ease of operation and hygienic safety: with its Innopouch Bartelt® K series KHS presents a pouching machine with a full range of servo equipment. With an ever increasing variety of products to be processed this system offers the beverage and food market many advantages with its short setup times and high level of productivity. It can also be combined with the KHS Innopack Bartelt® CMC cartoner for a pouch packaging line from a single source. Consumers appreciate their low weight and easy handling, producers above all their low cost, as less material is needed for production: the pouch is definitely up to the minute. To date its growth in popularity was most discernible in the USA, yet demand for the practical pack is now also on the increase in Europe and parts of Asia. The best examples are smoothies or candies which are hitting supermarket shelves in this type of packaging with increasing frequency. 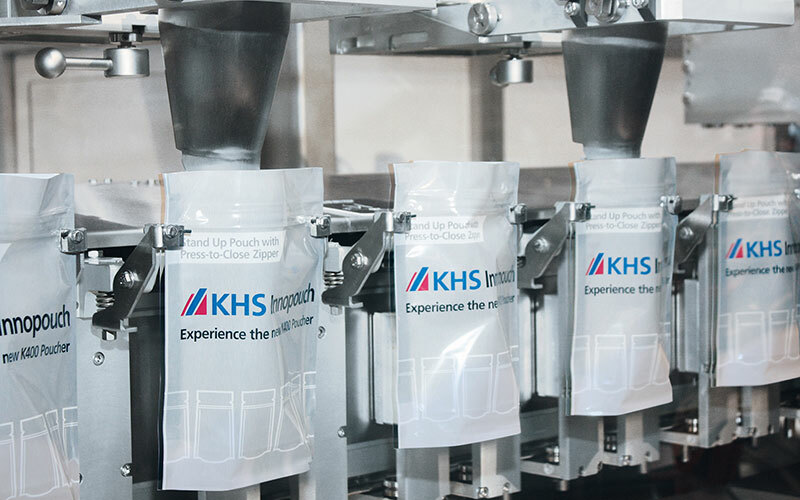 KHS offers customers its Innopouch K series poucher in two versions: an FS (fill and seal) machine for pouch filling and an FFS (form, fill and seal) variant for pouch production and filling. “The production stage can be flexibly retrofitted from the FS to the FFS version at a later stage as the machine is modular,” says Thomas Brooker, senior product manager at KHS USA. The horizontal, cyclic packaging system makes stand-up, flat and bottom gusset pouches from film laminate. It can run in both simplex (one pouch per machine cycle) and duplex (two pouches per machine cycle) operation. The Innopouch K-400 changes formats at the press of a button using linear servotechnology. “This takes less than 15 minutes,” explains Brooker. “We’ve simplified and automated the time-consuming simplex and duplex conversions common to mechanical machines.” For example, the grippers in the filler area can be adjusted to new pouch widths as quickly as they can be switched between simplex and duplex operation. The standard version of the machine has four filling stations connected in series which can be added to as required. The dosing systems are selected according to the product to be filled, with volumetric systems, such as auger fillers, table feeders and sliding gate fillers, and gravimetric systems like multihead weighers all possible. One special area of focus on the K series is its hygienic design. Thanks to the open construction there are no mechanical components beneath the grippers which require elaborate cleaning. In the machine housing spacers are used in place of the usual rubber seals. The film dispenser is also fully enclosed. These benefits considerably shorten the cleaning process. The concept of the pouching line can also be further developed in combination with the KHS Innopack Bartelt® CMC cartoner. “This enables turnkey pouching lines to be provided from a single source,” smiles Brooker. The machine, configured as a horizontal cartoning system with continuous operation, has a servodrive controller for increased operational reliability and faster format changeovers. KHS not only provides on-site service for the Innopouch K series but also remote maintenance by specialized engineers.